SEO v. PPC: Which one should your business use? When it’s time to invest in your business’ digital marketing you need to know where to allocate your funds to achieve the best results. The best way to do this is by gaining a clear understanding of the various avenues’ benefits and drawbacks. Taking the time to do this will pay off in a higher return on investment (ROI). Two of the most common avenues you’ll want to explore here are SEO and PPC. It doesn’t matter if you’re a start-up or an SME, you’ll want to take a close look at the differences here so you know which of these is best for your business. Having a clear understanding of what SEO (which is short for search engine optimization) is and what you want to achieve with it is imperative. For starters, you should know that every business and industry can benefit from it. 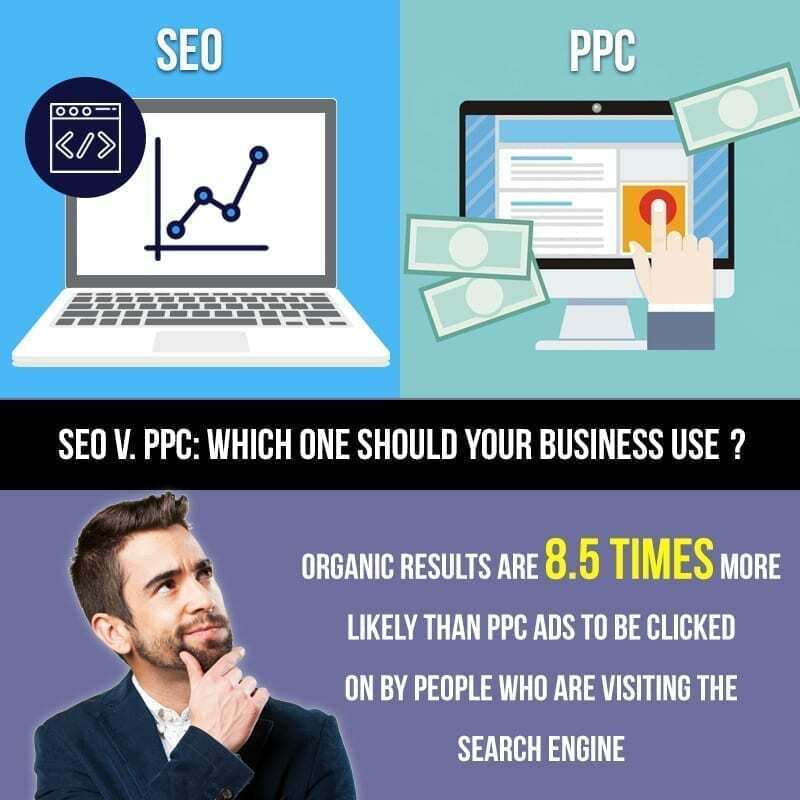 In fact, research shows that organic results are 8.5 times more likely than PPC ads to be clicked on by people who are visiting the search engine. This means there’s much more value for you here. However, the process of obtaining organic search results can be lengthy and difficult depending on just how competitive your target market is. However, its biggest weakness is the fact that algorithms tend to change regularly. This means learning how to stay ahead of the curve is imperative or else you may experience the same fate other businesses have in the past where you drop in rankings almost overnight. As such, SEO becomes more about maintaining the position you’re in instead of simply obtaining it. Pay per click marketing is different from organic search engine marketing because here you’re paying a specific amount of money for each person who clicks on your campaign. This price depends on the keywords you want to target within your ads, the quality of your ads and the competitiveness of your market. You’ll get a much higher conversion rate with PPC than you would with traditional SEO – traffic is about 1.5 times more likely to convert, but you’ll also be seen by a lot fewer people. Maintaining PPC for a long period of time can be expensive too, so make sure you have a large budget before you get started. How large of a digital marketing budget do you have? This is important because PPC can be expensive, especially if your market is highly competitive. A small budget won’t necessarily get you the results you need. On the other hand, you’ll probably need a monthly retainer for someone to do search engine work for you. However, this is a long-term, gradual process, and should be seen as an investment that gives you better results the longer you’re involved in the process. How high is the average CPC (cost per click) in your industry? Determining the answer to this will help you understand if PPC is a worthwhile investment. How competitive are the SERPs (search engine results pages) within your niche? Answering this question will help you see whether a strong SEO position is even a viable option on the budget that you have established here. Deciding between these two options will leave you asking a lot of questions. Affordable SEO Florida is here to help you find the answers you need. We’ll work with you to create an effective campaign based on your budget. Contact us so we can get to work on this for you today.